This week is (supposedly) the last week for the legislative session. The House and the Senate are still trying to work out the budget, a constitutional requirement before they can go home. Today marks the last day to come to an agreement before the 72 hour cool off period and then a final vote on Friday. Late Monday the chambers were still $200 million apart, most of that in the area of health and human services. As they work out a deal on the budget, there are several other important bills working their way toward passage. Last week the House passed 6 anti-choice bills, and the Senate passed 2. Today the Senate has put 2 more anti-choice bills on the special order calendar. A bill tightening up current parental notification (SB 1770) and a bill that would mandate a woman view an ultrasound before an abortion (SB 1744), a bill that was vetoed by Gov. Crist last year. The Voter Suppression (SB2086) bill is also up in the Senate today. The bill would have sweeping changes in current election law. 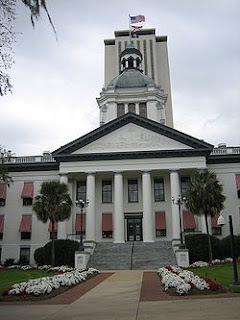 Equality Florida opposes the anti-choice, and anti-voter bills that are up in the Senate today. CALL Senate President Mike Haridopolos at 850-487-5056 and tell him the Senate needs to focus on jobs, not eliminating a woman's right to choose and making it harder for people to vote.